How often do you feel stressed from work, or from time to time have low self-esteem or just feel minor aches & pains? There are very few places where you can feel weightlessness, peace, happiness, joy and awesome encounters up close with nature; all in one experience. Scuba diving is a great way to travel and immerse yourself in different cultures, meeting new people and trying new things and whilst doing so, gives you that feel good factor and sense of well being. Dropping below the surface takes us away from talking, noise, technology, stresses and problems. We just have to breath, relax and blow bubbles! Whilst watching everything that passes us by. 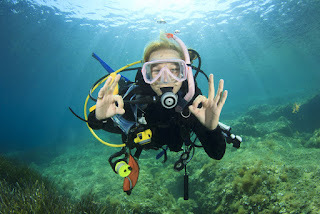 Diving can give you time to think or just switch off. We are in the moment, just tuned in to ourselves and the environment. It is like a therapy. If you're learning to dive for the first time, there is a sense of achievement in accomplishing something special, boosting confidence and self esteem at the same time. Or you may already be a diver and are having a 'fat' day or just an off day and once underwater, the sense of freedom and fun just takes those feelings away. So what more reasons do you need to get wet and come diving?? ?